Left-brain art activities don’t have to be boring – they can be filled with exciting ways for enticing kids to tap into the benefits of combining both sides of the brain into one fun creative machine. Kids often let the dominant left-brain take charge forgetting the beneficial creative right-brain completely, leading to comments such as, “I can’t draw.” Encouraging creative left-brain art activities promotes self-confidence and the child’s brain to work together when getting creative and problem solving. -Look at patterns with the child and discuss how they are created. The left-brain is encouraged when the big picture is looked at instead of the small parts of a project. -Offer your child a sheet of white drawing paper and a set of crayons. Younger children can enjoy the process of engaging the logical left-brain through creating simple shapes, while older toddlers can attempt to create patterns using both colors and shapes. Or, if you’ve got a real young one, help them out by creating a few shapes together. -Remove the crayons once he’s finished making patterns. Your child can now paint all over the paper using watercolors, practicing dipping his paintbrush into the paints on his own, which develops fine-motor skills. Invite him to paint without concern for staying within lines or following any set directions, allowing his creative right-brain to coordinate with his left. -Discuss the finished artwork together further engaging the child’s visual cortex and his creative development. Talk about what he liked about the art making process and encourage him to explain his finished patterns. As kids age and become more critical of their artwork, encouraging left-brain art reminds them that artwork doesn’t have to solely rely on creativity but can be accomplished through using left-brain skills, too. Create a geometric design with your child, which encourages basic math knowledge as well as artistic skills. -Discuss geometric shapes with your child, having him draw pictures of as many as he can and then write the names of the shapes, further engaging his left-brain. -Invite the child to select three shapes to use for his geometric design. -Give the child a sheet of white drawing paper and have him draw the first shape he selected with a marker so that it almost touches the sides of the paper. Offer him the use of a ruler to help create his lines. Then he can draw the second shape within the first, and the third within the second shape, making his three shapes all within each other. 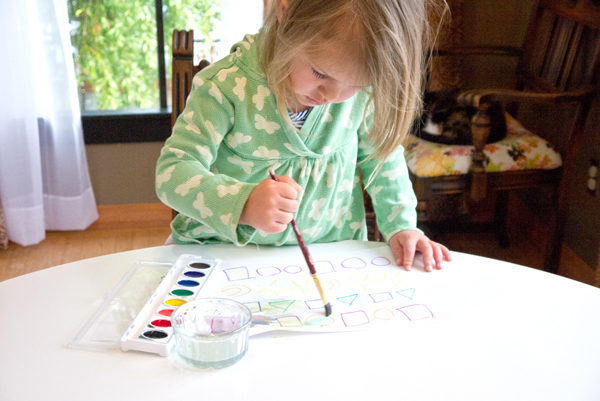 -The child can now use markers to color each shape in, using a different color for each shape. -Discuss how the finished creation is an abstract masterpiece, full of shape, line, and color. Older children begin to lose interest in art as they age, which is also partly due to art classes not always a part of many middle schools and high schools as a required subject. Preteens are at risk of missing out on honing creative skills and finding ways to remind the brain that merging right and left-brain talents helps form a complete human being. Challenge kids by creating a 3D sculpture from a piece of construction paper. -Provide the child with an 8 by 10-inch piece of construction paper and invite him to figure out a way to create a freestanding 3-dimensional form using solely the paper and a pair of scissors. -Look at modern sculptures by the American artist David Smith, and discuss how he came up with the motivation to make the interesting forms. Discussing artwork stimulates the visual cortex and promotes use of the right brain. –Brainstorm ideas for how your child can create the sculpture. Working through the problem to find a solution kick starts the left-brain, making it ready for the challenge. -Encourage the child to fold, cut, and shape the flat paper into a form that is able to stand on its own without support. -Once finished, display the folded and cut marvel in a location for the whole family to enjoy. Once kids hit young adulthood, they become aware of their inabilities in the area of the arts. Most feel they aren’t creative, where in reality creativity is hiding out in the right-brain just itching to get out. By creating a mathematical grid drawing, your child is able to easily and comfortably recreate an image without fear of mistake or disappointment – and pulling out that hidden creativity. –Chuck Close is an American artist that uses mathematical grids to recreate photographs into larger than life portraits using pointillism. Look at examples of his work with your teenager and discuss his techniques. -Invite your child to find an image from a magazine or an actual photograph to recreate in the style of Chuck Close. -Using a ruler and some basic math, he can figure out how to enlarge the small image onto a larger piece of paper. For instance, if the photograph selected is 4 by 6-inches, he can create a grid with marker lines every 2-inches around the image. The small 4 by 6-inch image can be enlarged onto a 12 by 18-inch piece of paper with a grid drawn lightly in pencil every 6-inches around the paper. -Your child can use markers to recreate the image using large and small dots of color, encouraging the left-brain to work methodically from one square to the next in the grid formation. -Due to the left-brain not feeling challenged to create a realistic image, the right brain is able to offer a helping hand, which allows your teenager’s artistic abilities to shine through without him even realizing it. -Display the finished grid drawing alongside the picture, sharing with others how the artwork was created.